We explore the question marks surrounding dynasty stars in the AFC East and AFC North. What does the future hold for Big Ben? This time of year is among my favorite parts of the football season. With the Super Bowl now in our rear-view mirror, we can look forward to the NFL Combine, free agency and the other events of the upcoming months. There truly is no off-season! 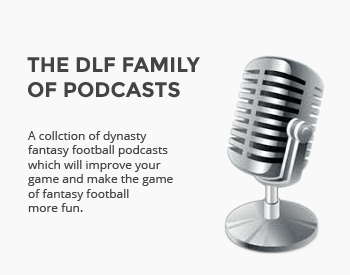 At DLF, we have wrapped up our Dynasty Capsules, an in-depth look at the offensive skill players for each team, including an analysis of players’ past performances along with some projections going forward. To accompany that series, I wanted to share some off-season storylines I’ll be watching play out for each NFL team. Many of these are similar as they have to do with new coaches, free agency and the NFL Draft, all major events of every off-season. Let’s get to it! Yeah, that probably wasn’t a fair statement. What I was trying to say was that they are always contenders, yet never seem to make the SB. Of course, a lot of that has to do with NE. I think releasing Taylor would be a mistake. There really isn’t anyone else out there – and if I’m Sean Mcdermott, I’d be worried about starting off my tenure with Cardale Jones or using a valuable top pick on a lottery ticket of a quarterback in a league where I only get 2 or 3 years to keep my job. I suppose it’s not his call to release Taylor but he has to have some say or I’m not sure he would have accepted the job. His cap hit is only around $15.9 million (20th highest cap hit among qb’s) and the average amount of his salary (according to spotrac) over the course of its duration is $18 million. I think there’s more than meets the eye with that $27 million dollar figure that is being tossed around like it’s the end of the world. Oh, I agree, but I think it is going to happen. The Bills haven’t been the best decision makers recently, including giving him that contract in the first place.